My thoughts on Free Trade agreements appeared in the April issue of WineLand magazine. According to the latest SAWIS report released in early February this year, the wine industry creates employment for close to 300 000 people. This is such a positive picture, but it would be negligent to ignore the industry’s challenges – the most important of which I consider to be profitability. According to a recent Vinpro study one-third of wine producers operate at a loss! Considering the contribution the wine industry is making on a provincial and national level, government support is certainly expected, but it still stays a contentious subject. 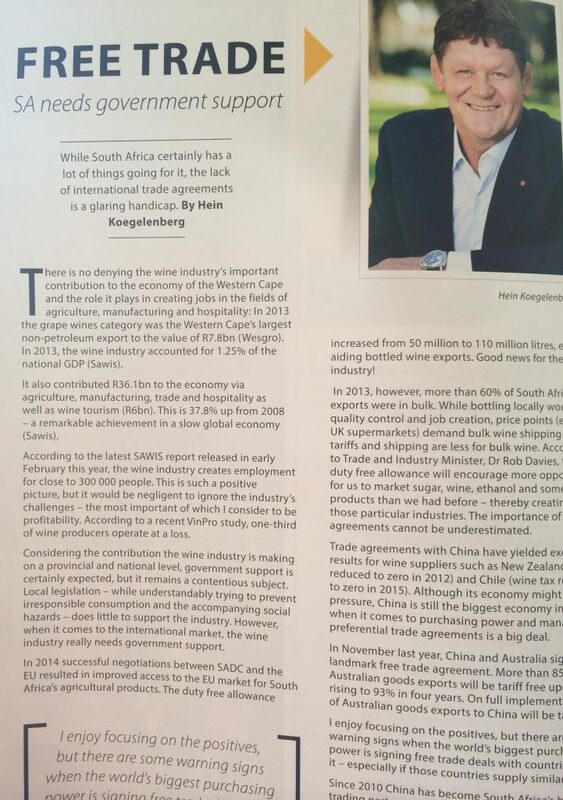 Local legislation while understandably trying to prevent irresponsible consumption and the accompanying social hazards, does little to support the industry, but it is when it comes to the international market that the wine industry really needs government support. In 2014, successful negotiations between SADC and the EU resulted in improved access to the EU market for South Africa’s agricultural products. Good news for the wine industry, the duty free allowance increased from 50 million to 110 million litres, especially aiding bottled wine exports. In 2013, South Africa exported more than 60% of its wine in bulk. While bottling locally would benefit quality control and job creation, price points (especially in UK supermarkets) demand bulk wine shipping as customs tariffs and shipping are less for bulk wine. The new duty free allowance will however encourage “…more opportunities for us to [market] sugar, wine, ethanol and some fruit products than we had before, and that could create jobs in those particular industries”, said Trade and Industry Minister, Dr. Rob Davies. The importance of such Trade Agreements cannot be underestimated. They have worked exceptionally well for wine suppliers to China such as New Zealand (wine tax reduced to zero in 2012) and Chile (wine tax reduced to zero in 2015). Although its economy might be under pressure, China is still the biggest economy in the world when it comes to purchasing-power, and managing preferential trading agreements is a big deal. I enjoy focusing on the positives, but there are some warning signs when the world’s biggest purchasing power is signing free trade deals with countries closer to it – especially if those countries supply similar goods!